Meet the Cast: Rizzo! "I blummin HATE Summer Nights"
Hard girl and leader of the Pink Ladies, Rizzo, is played by Nicole Rose. Tell us a bit about Rizzo: She’s the leader of the Pink Ladies and sometimes girlfriend to Kenicke, harsh, tomboyish, sarcastic, takes no crap but underneath she’s actually very vulnerable. What’s your favourite song in the show and Why? I absolutely adore nearly every song in Grease (apart from Summer Nights, which I blummin hate) I think my favourite (and not because I get to sing it) is “There Are Worse Things I Can Do”. It’s the first time in the show that you see Rizzo’s vulnerability and you actually empathise with her. More than that, it’s a lovely song with some very poignant lyrics. What other shows have you done? : Ummmm *takes a deep breath* Return to the Forbidden Planet (Gloria), A Streetcar Named Desire (Stella), Little Shop of Horrors (Ronnette), Hot Mikado (Pitti Sing), West Side Story (Graziella), Habeas Corpus (Mrs Wicksteed), Girls Night Out (Auntie Ivy), Oklahoma (Gertie), Me and My Girl (Mrs Brown), David Copperfield (Aunt Betsey), Guys & Dolls (General Cartwright), The Vicar of Dibley (Alice) and numerous Panto’s where I have mainly had the displeasure of playing Principal Girl! 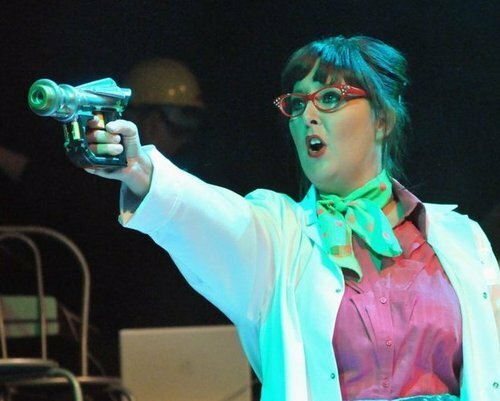 Best or Worst Moment on Stage: I’ve got loads of fantastic moments on stage I could mention but the best has to be the entirety of Return to the Forbidden Planet – definitely the best show I’ve done. The worst was being hit, every night, around the face during the famous STELLLLAAAAA scene in “A Streetcar Named Desire” and the actor who played Stanley managed to perforate my eardrum – ouchy!! Interesting Grease Fact #7: Stockard Channing wasn’t the first person considered for the part of Rizzo, it was actually Lucille Ball’s daughter, who turned the part down. Also, Rizzo’s hickeys were real! Stockard Channing said in an interview that Jeff Conaway insisted on applying them himself.